$15.00 Minimum donation enables you to participate in the language classes. And other aspects of the tribe. As a thank you, you will receive a beautiful certificate of honor. 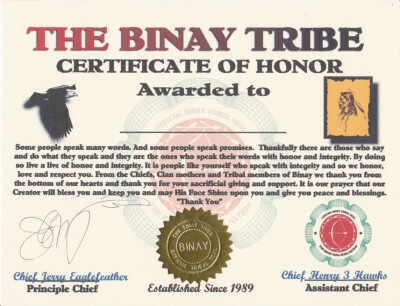 And if your a tribal member you will also receive a special card along with this certificate. Thank you for donating to your tribe. Please know that you will be blessed by our Creator for your giving. Every dime used every penny goes for the betterment and support of the tribe. You are helping the tribe maintain the web site, the hosting service, the phone calls, the news letters, the time and effort it takes to grow. We thank you and hope that you enjoy the blessings coming your way as a result of your giving.....I am constantly working on ways to bless our tribe and you will benefit from it. When we generate enough revenue, we will have a legal fund set aside for members if you should need a lawyer. I will keep you informed about that when it developed. We are working on a very cost effective medical program for tribal members. These things happen faster when we give together, so please give generously. Please chose one of the options to make your "Monthly Donation"
Thank you and may our Creator bless you. Please use your PayPal account or debit card or credit card to make your donation. Your card will be charged on the same time each month unless you request a stop. Please note: You are under no obligation to give and your tribal membership will not be affected if you chose not to give. The only downside is that it will take the tribe longer to develop. And grow if we do not all stick together in this en devour. Please chose one of the donation buttons and click on the link to set up your monthly donation. We thank you with all of our hearts as you help us to continue growing and helping others to achieve their goal in honoring their ancestry. Please take this opportunity to do as much as you can. If you cannot give monthly but would like to give something. You can chose the amount you would like to give below. You will still receive a thank you letter and certificate of the amount you donate. And while we hope you could do monthly you can always come back each month and make another donation. You will be blessed. Thank you.....Yeha Noha Binay.